MARIETTA, Ga.– Play Me Again Pianos, a nonprofit aspiring to make metro Atlanta more musical through 88 public piano installations, will cut the ribbon on its newest donated piano Wednesday, Jan. 9, at 6 p.m. at the Sewell Mill Library and Cultural Center. The event is free and open to the public, and anyone is encouraged to play the piano, named “Vincent,” after the ribbon-cutting ceremony. The eventual 88 pianos represent the 88 piano keys. Vincent, the 20th installed overall and the first of several indoor installations, joins Sunny (at East Cobb Park) and Tommy (at the Egg Harbor Cafe) as neighborhood pianos in East Cobb. Donated by Michael and Rebecca Cochran, Vincent was designed and painted by local artist and Arts Coordinator at the Sewell Mill Library and Cultural Center, Suzzanne Anicette. “The idea and design for Vincent grew out of a desire to have an easily recognizable reproduction of a Master work, since we’re placing him inside the Gallery,” said Anicette. “I wanted to depict the feeling of Van Gogh’s Starry Night using slightly more vibrant colors to entice players and help them feel at ease enough to enjoy playing. “Being an artist that is primarily a painter, it was a challenge to paint a cohesive scene on an object that will be viewed from several angles. Having said that I enjoyed it so thoroughly that it’s likely that this concept will reappear in my personal artwork and be imaginatively interpreted over and over again. Vincent will live permanently in his new home at the Sewell Mill Library and Cultural Center, the Carol and Jim Ney Gallery. The day after Vincent is unveiled Sewill Mill will host a ‘Play In’. 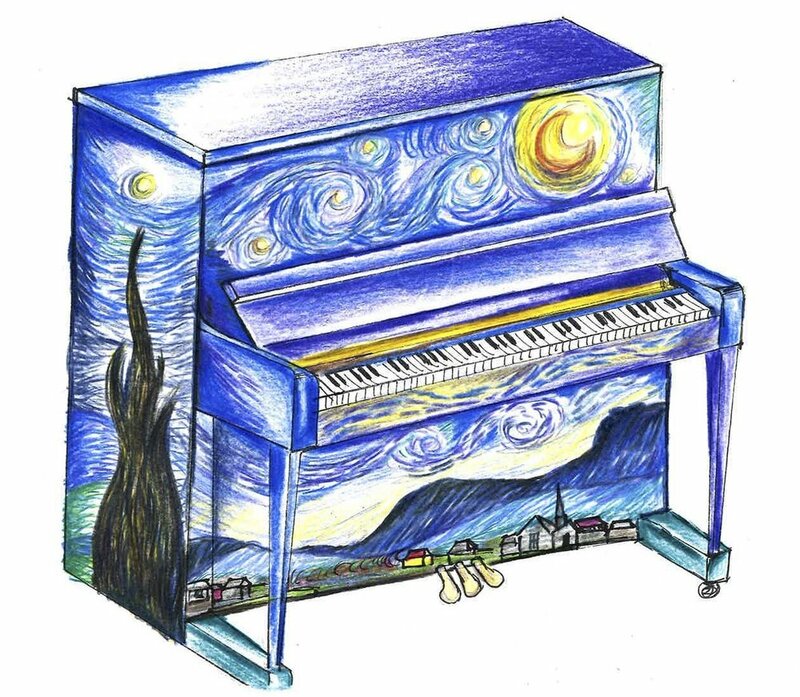 On Thursday, Jan. 10, from 10 a.m. until 5 p.m. the ‘Play In’ will be an all day hands-on rotation of staff from the Cultural Affairs Division of Cobb County PARKS and the Cobb County Library system playing the piano to celebrate the new addition of Vincent to their facility. With the increasing rarity of home pianos, public access to them enriches the entire community. For more information about the volunteer opportunities and the impact of Play Me Again Pianos, visit www.PlayMeAgainPianos.org. A registered 501(c)(3) nonprofit charity founded in Georgia in 2016, Play Me Again Pianos places, maintains and promotes public pianos to strengthen communities, inspire joy and bring people together through shared encounters with public music and art. Each piano is uniquely painted by a variety of volunteer artists ranging from internationally acclaimed professionals to aspiring students. The organization is currently working to place 88 pianos throughout metropolitan Atlanta. To find a map of Play Me Again Pianos installations, donate, volunteer or find out more, visit www.PlayMeAgainPianos.org. Suzzanne is an Artist and Art educator who joined the Cultural Arts Division of Cobb County PARKS in January of 2018. She taught Visual Arts for 17 years in public schools within the Rochester City School District, Atlanta Public Schools and a Fulton County Charter school system as well as community arts centers and museums. Suzzanne was born, raised and educated in Rochester New York. She holds a Bachelor of Arts from the University of Rochester where she studied English Literature, Studio Arts and minored in French language. Suzanne went on to pursue a Master’s in Art and Design Education at Pratt Institute in Brooklyn New York. She views joining the Sewell Mill Library & Cultural Center as the ideal venue to continue to participate in and present arts to the community. Sewell Mill Library & Cultural Center is a Cobb County tax-supported Library and Arts facility. This unique hybrid facility falls under the Cobb County PARKS Department Cultural Affairs Division as well as the county Library system. While these two entities are separate, the partnership between PARKS and the library system unifies community resources to maximize access to the amenities. We provide educational services in visual and performing arts in Cobb County. Our performance venues, the Black Box Theatre and outdoor amphitheater, are community resources for both internal and external arts outreach programs providing a setting to display and nurture arts development within the county. For more information, visit www.CobbCounty.org. Find and play Vincent inside the lobby near the Black Box Theater. If you have a story with Vincent that you’d like to share, please do so, we’d love to hear from you! We’d also enjoy seeing your pictures and videos.